Obama At Dallas Memorial: 'We're Not As Divided As We Seem' : The Two-Way Honoring the five officers who were killed last week, the president spoke about strains on police and race relations. Former President George W. Bush also called for unity. 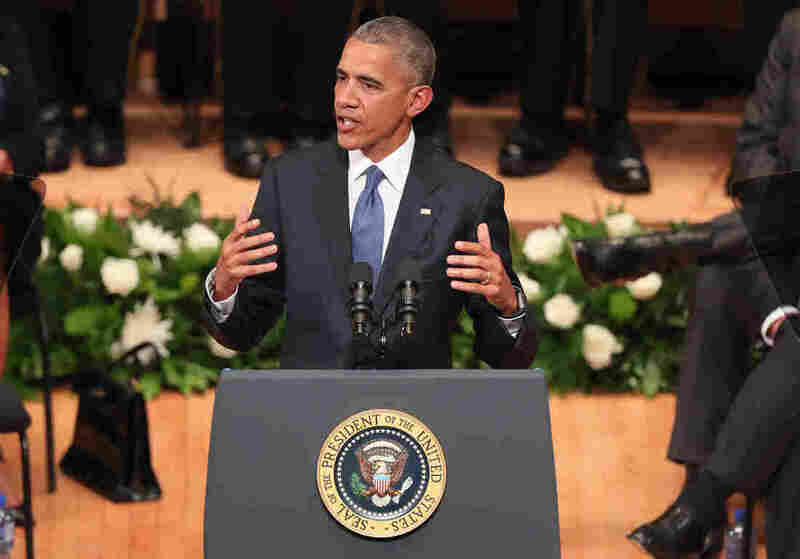 President Obama delivers remarks during an interfaith memorial service honoring five slain police officers, Tuesday at the Morton H. Meyerson Symphony Center in Dallas. President Obama and former President George W. Bush spoke at an interfaith memorial service Tuesday afternoon for the five police officers murdered in Dallas last week. Bush, a resident of Dallas, noted that he interacts with law enforcement every day. "We're proud of the men we mourn," he said. Bush called the shooting last Thursday evil and said the shock of the attack had not yet faded. He also appealed for unity. "At times, it seems like the forces pulling us apart are stronger than the forces binding us together. Argument turns too easily into animosity. Disagreement escalates too quickly into dehumanization. Too often we judge other groups by their worst examples, while judging ourselves by our best intentions." Obama acknowledged the pain of the racially charged shooting. "Faced with this violence we wonder if the divides of race in America can ever be bridged," he said. "Dallas, I'm here to say we must reject such despair. I'm here to insist we're not as divided as we seem. I know how far we've come against impossible odds," the president said. He praised the Dallas Police Department for being on the forefront of policing reform and noted that the number of complaints about excessive force by police has gone down in the city in recent years. "The Dallas Police Department has been doing it the right way," he said. Reserved seats at the memorial service contain American flags and police hats to honor the five slain officers. But, he added, prejudice does exist in American institutions, including police departments. "We also know that centuries of racial discrimination — of slavery and subjugation and Jim Crow — they didn't simply vanish with the end of lawful segregation," he said. "America, we know that bias remains. We know it," the president continued. "None of us is entirely innocent. No institution is entirely immune." The president also argued that protesters working for police reform "do a disservice to the very cause of justice that they claim to promote" if they paint all officers as bigoted. Before an audience made up mostly of law enforcement officials, Obama noted that the officers on the scene of the attack reacted to the gunfire by shielding civilians. They "saved more lives than we will ever know," he said. "We mourn fewer people today because of your brave actions," he said, turning to address Dallas police who were seated onstage behind him. The victims, four of whom served with the Dallas Police Department and a fifth who served with the Dallas Area Rapid Transit police, ranged in age from 32 to 55. They were identified as Patrick Zamarripa, Michael Krol, Lorne Ahrens, Michael Smith and Brent Thompson. You can read more about their lives here. 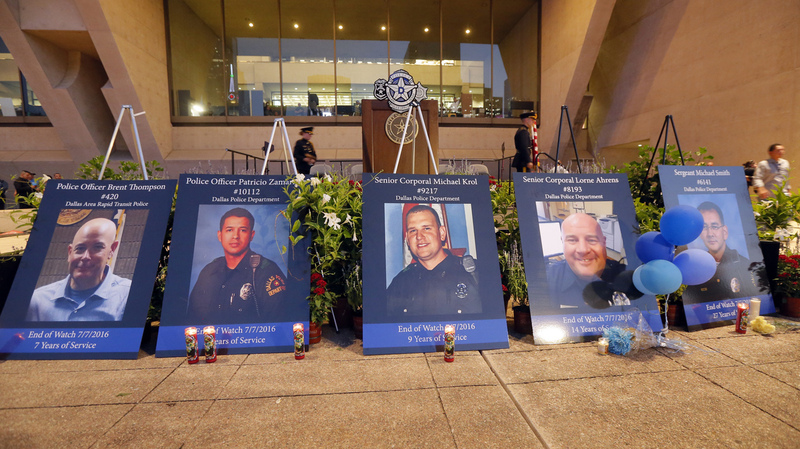 Portraits of the five murdered Dallas police officers sit in front of city hall. In brief remarks before introducing the president, Dallas Police Chief David Brown expressed love for the fallen officers and quoted lyrics by musician Stevie Wonder. "We all know sometimes life's hates and troubles can make you wish you were born in another time and space," he quoted from the song "As." "There's no greater love than this," he said, "that these five men gave their lives for all of us." Texas Sen. John Cornyn also addressed the crowd, offering his condolences to the families of the slain officers. Sen. Ted Cruz; Vice President Biden; his wife, Jill Biden; first lady Michelle Obama and former first lady Laura Bush also attended the service, as did numerous mayors and other elected officials. 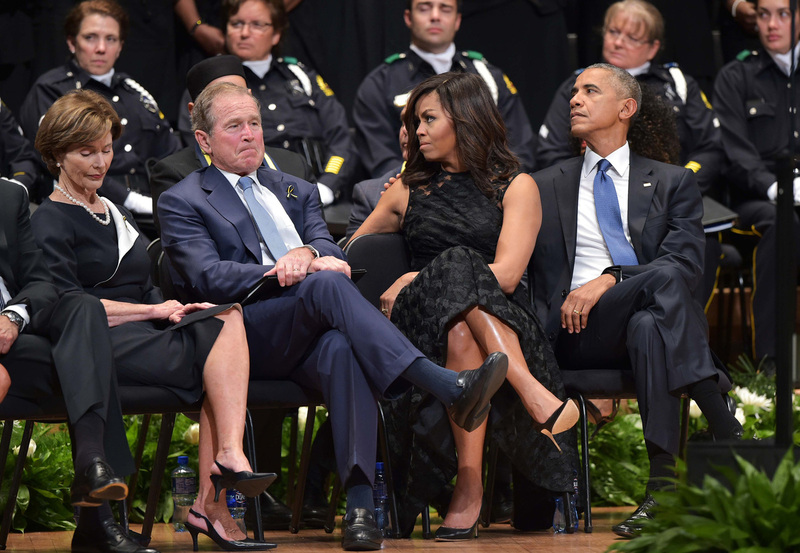 Former first lady Laura Bush, former President George W. Bush, first lady Michelle Obama and President Obama attend an interfaith memorial service for the police officers killed in Dallas. 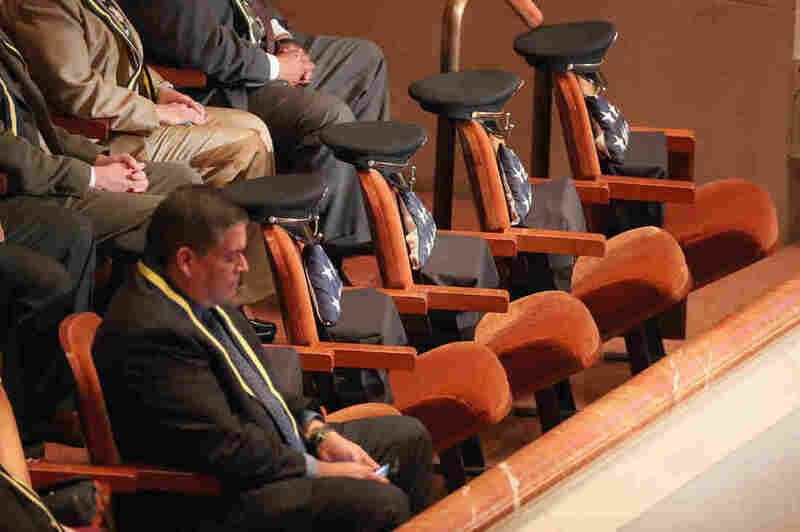 The memorial service was held at the Morton H. Meyerson Symphony Center music hall in downtown Dallas, about a mile from where the police officers were gunned down. The killer, Micah Xavier Johnson, "stated he wanted to kill white people, especially white officers," Brown said Friday. Johnson was killed with a bomb after a standoff with police following the shooting. Brown has called for calm and unity in the wake of the attack. On the flight to Dallas from Washington, D.C., the president placed telephone calls to family members of Alton Sterling and Philando Castile, both of whom were killed by police officers last week, to express his condolences for the death of their loved ones. Former President George W. Bush begins speaking around 1:27:00; President Obama speaks around 1:42:00.